The MetteQ Group focuses on manufacturing and supplying high-tech consumable products to the chemical, metallurgical, construction and agricultural industries. We are a customer-focused group of businesses owned by engineers with a passion for technology. We design and build our own equipment and, being owner-managed, can be price competitive in a high-tech environment. We have a vision of developing a large, multi-product facility using in-house, core technical competencies to ensure we remain commercially relevant. Sun Silicates is only the second South African manufacturer of Potassium Silicate. Sun Silicates is only the second South African manufacturer of Perlite filtration media. SunPerl horticultural Perlite is the only South African product equivalent to imported products. Matutu Milling is the only South African company that supplies calcined Attapulgite for use in speciality absorbents in the agricultural and energy sector. Sun Silicates is the only South African company to supply a complete range of Perlite and Vermiculite products. Sun Insulation is the only local company that manufactures and produces both Vermiculite-and Perlite-based insulation and refractory concretes. Sun Silicates is an ISO 9001:2015 and Halaal certified producer. CemteQ is the only South African producer of engineered blends of Perlite, cement and special admixtures for the construction industry. We pride ourselves on an inherent culture of engineering excellence and exceptional technical support with highly qualified and experienced engineers and many years of professional experience. With an emphasis on the needs of our customers, our people are technically astute, flexible and quick to react. The MetteQ group has a centralised management structure ensuring efficient and cost effective overheads. 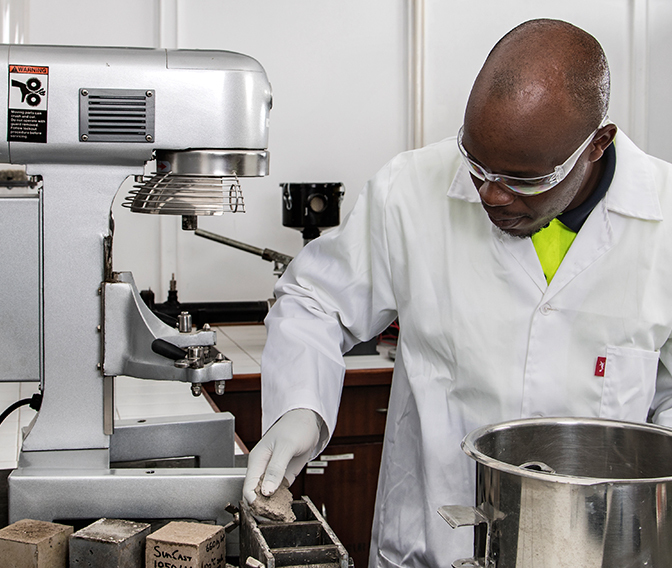 Through ongoing innovation, we ensure that our products are world-class and offer excellent value. Sun Silicates is an ISO 9001:2015 certified company ensuring that our products are always consistent. We also have Halaal certification, ensuring both food safety and peace of mind. We pride ourselves on our customer retention rate which is achieved through competitively-priced, quality products and world-class technical support. As a professional company, we ensure that we have state of the art finance, human resources, customer relationship, laboratory and quality control systems and procedures in place. Our qualified and experienced staff, including metallurgical, chemical and mechanical engineers, play a significant role in the professionalism of our company. As a proudly South African manufacturing facility, we place particular emphasis on our Health and Safety and training programmes. We provide in-house and external training, all of which is accredited as we see the growth potential of our employees and future opportunities as a high priority.